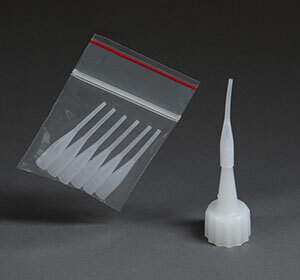 Our CAs come in 1/2 oz., 1 oz. and 2 oz. sizes, along with an 8 oz. 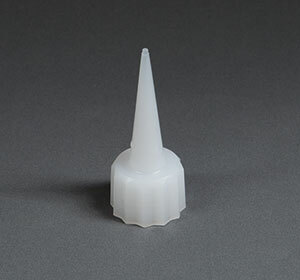 that has a no mess, easy pour bottle for economical refilling of our regular bottles. 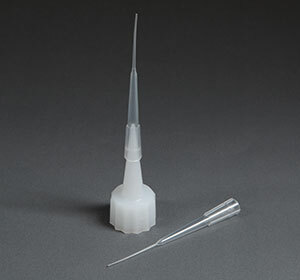 In addition to our line of extender tips and fine PTFE tubing that allow very small, controlled amounts of CA to be applied, we have CA applicators that come in both a regular and fine tip. 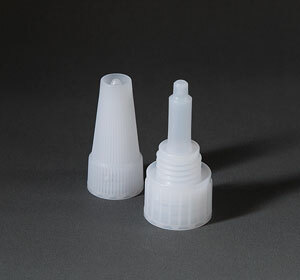 Just squeeze the bulb and insert into an open CA bottle to draw out the amount you need. 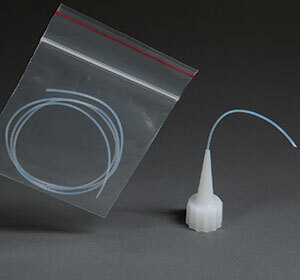 When using the PTFE tubing, cut one end at a 45 degree angle before inserting no more than 1/4 inch into the bottle top. For use over the standard #312 top, it allows BSI's thin CAs (Insta-Cure, Insta-Flex and Super-Gold) to be applied a drop at a time. 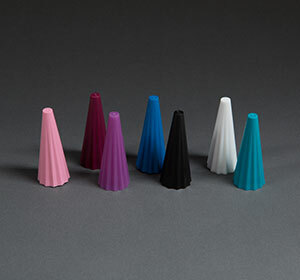 Thin CA tends to run everywhere, so these allow precise application. For use over the standard #312 top, they provide a rigid tip with extended length to get thin and gap filling CA into hard to reach areas. They are very resistant to clogging and can be cleaned by soaking in acetone. For use with BSI's Pocket CAs. It slips over the tip of the Pocket CA top to allow for finer application of the CA. 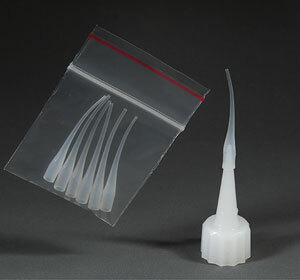 With the tip, the CA can be applied to confined areas. Two foot length of tubing can be cut off to any length (usually 2"). With one end cut at a 45° angle, can be inserted 1/8" into Pocket CA top and into #312 top if it is cut down an additional 3/64". For thin CA. Replacement colored cap that fits over the #312 top. 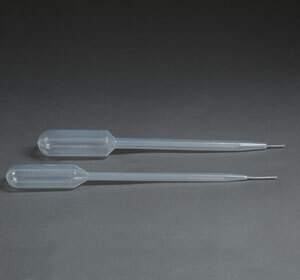 #322 - Fine Tip Non-clog 6" long pipette for the application of thin CAs. Can also be used for the fine application of Insta-Set accelerator and for applying fine lubricating oils. 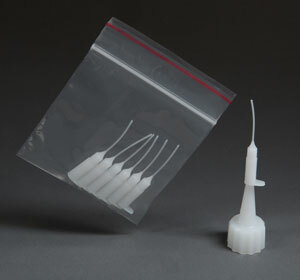 CA can be kept in the applicator for two weeks.